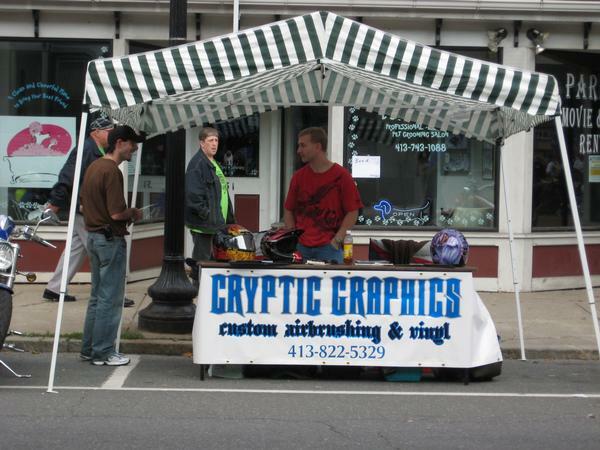 Welcome to Cryptic Graphics where we specialize in providing quality custom airbrushing for motorcycles, cars, helmets, and just about anything you can paint on. There are no limits to airbrushing except one’s imagination. Whether it’s simple graphics or complex mural with flames we will create a final product that will satisfy you. We take pride in our work and don’t rush projects, believeing in quality not quantity. We can provide a head turning custom paintjob for your motorcycle, helmet, snowmobiles,or RC car with a show quality finish. Your custom art work will be protected with the highest quality clear coats. Nothing leaves my shop imperfect, even if it means putting more work into it than originaly expected at our cost not yours. As well as any color you can imagine. So if you want your helmet, motorcycle, guitar (etc..) to have a custom paint job that will make you "stand out from the crowd" drop me a line and let us know what your looking for. We’ll give you an estimate of how long it will take, and what it will cost. If you have a picture or sketch of your idea, or if you want us to compose an idea from one, just email it to me and we’ll see what we can do! Cryptic graphics also can provide you with quality custom made die-cut stickers, banners, and signs for your business, party, special event or pesonal use. We have many different colors to choose from. We will do single stickers, banners, t-shirts or hundreds, whatever your needs are.